This holiday season, we want to inspire and contribute to your gift giving process. Who doesn’t enjoy making family members work for their gifts by sending them on a little bit of a hunt! The folks here at The Locked Room are all about moving around, giving the ol’ brain a workout, and having a good time! 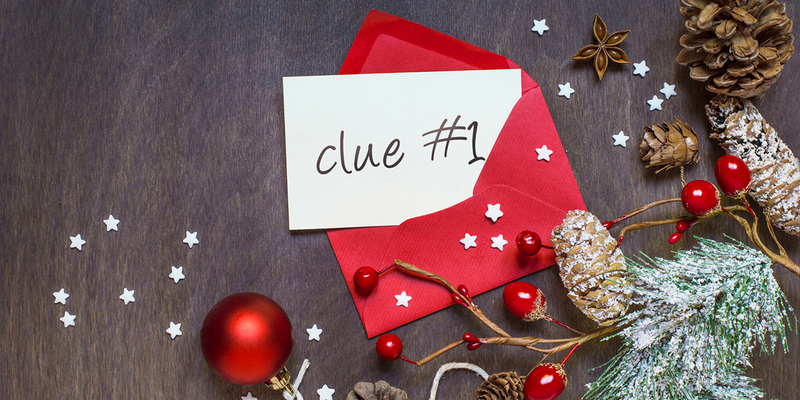 The idea behind the gift hunt is to create clues (often rhyming) that will lead a person from one clue .. to another clue .. to another …. (how ever many you want) .. to a final clue that will reveal the location of their gift. You can have them in envelopes, wrapped as a decoy gift, or hidden in the tree itself – just make sure you write down where you hide them (just in case). In the closet is the GIFT! Below is a link for a printable 2-page PDF with a few rhyming clues (and a couple blank cards for you to add in your own if you wish) that you can use to make a Holiday Gift Hunt for the people on your list. Consider adding a little fun and a memorable experience to your gift giving this holiday season by starting this new tradition. And don’t forget – our Locked Room Gift Cards make excellent gifts and stocking stuffers! TO YOU AND YOURS FROM ALL OF US AT THE LOCKED ROOM!